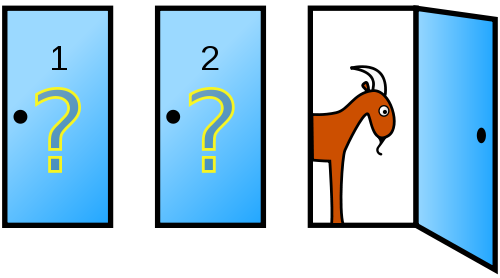 The Monty Hall problem was created by Steve Selvin and is a classic puzzle whose correct answer is counter-intuitive almost to the point of disbelief. As this page explains, even some of the most competent mathematicians of the 20th century refused to accept the correct answer to the Monty Hall problem for a long time. Suppose you’re on a game show, and you’re given the choice of three doors: Behind one door is a car; behind the other two doors are goats. You pick a door, and the host, who knows what’s behind the doors, opens another door, revealing a goat. He then says to you, “Do you want to change your selection?” Is it to your advantage to switch your choice? What does intuition tell us? After the host opens one door, revealing a goat, we are left with two closed doors, one hiding a car and the other a goat (50% chance of success either way), intuition would lead us to conclude that there is no difference in our chances of success if we switched doors or not. If only life were that simple………….